Snowman spent the night riding a bus from Land o'Lakes to Music City, to visit Plain2See, his harpist girlfriend.When I suggested that Snowman might be able to visit her, he expressed surprise that I would let him ride a bus and go there first on his way home from his summer job at Land o'Lakes Art Camp. "Honey," I pointed out, "you are going to college at the end of the summer. You'll be able to get on a bus and go anywhere you want without asking me." That he seemed surprised tells me life at boarding school was all I hoped it would be. He will have three days to visit before flying home Friday afternoon. Her dad is a musician, and I understand they will be making music, even going into the recording studio with him. I expect it will be most beautiful. “Plain to See”…she is the right one for him? hmmm. huh. can’t guess the nickname, but yay for you, and for him. Grasping at straws here. No idea. Something about a double-strung chromatic? Just a guess; I prefer the Flatt and Scruggs style of five-string harp, so I don’t really know much about these. I will give a one word hint: Prince. That hint really throws me off. Purple Rain?! No idea about the nickname, but I LOVE your new look! Hey, Rev Dr Mom is rightthe room did change! Nice redecorating, Songbird! I googled (cheated) and found the answer. But I won’t give it away so someone else (who might be more familiar with Prince) can win. If it is part of a Prince song lyric then I am totally out of the running…unless you nicknamed her “Little Red Corvette”! Plain2see…that she’s the most beautiful girl in the world? Thank goodness it isn’t Harpy! Love the new look! 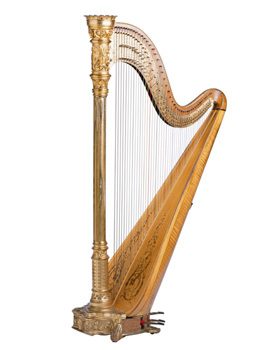 I didn’t guess the nickname, but I learned a lot about harps! I just stopped by to say that I love the new blog layout! You keep me motivated to want to have a cool blog, too!